Had a nasty storm come through earlier in the week, I think Tuesday Aug 16, sometime in the AM. Four days later and I still haven’t turned on the primary server which has faithfully hosted VMware Server 1.0.x and several VMs for the past two years on Ubuntu Hardy 8.04 LTS. I was able to leave the VMware Server host off because the previous Sunday the last of my hosted clients were finally moved to other hosted services ergo I no longer answer to others regarding my equipment. Finish the surround sound speaker installation. Upgrade daughter’s PC. Most likely will install Ubuntu but not 100% certain of that yet. Finish configuring the Cisco 871/877/878. Clean out the home office in preparation of refactoring my existing equipment. Do the yard: Cut grass, trim hedges, pull weeds, and edge yard. Also spray lawn/driveway/porch. Move a hydrangea. Need new mulch too but think I’ll wait till this fall when I plan moving a 1/4 ton of dirt to the back yard to level it out and fill some doggy holes. Finally (and permanently) setup my drum kit. A fine breath of fresh air after a two year storm of hands on research, time consuming clients, and random Comcast outages — which at the moment I don’t have to worry about any of it one iota. After spending the last two years really wrapping my head around Ubuntu Linux, I am going to build my first Cloud Cluster Node. In the meantime I will be reallocating the hardware I currently use for hosting experiments to start from scratch. This means that netritious.wordpress.com is the permanent home for Netritious.com. So there you have it folks. Email is the same and feel free to contact me. Will update again when I have time. In order to achieve maximum service transparency this blog was moved to — you guessed it — WordPress.com. This way during service outages you will still be able to reach *SOMETHING* that will tell you wth is going on with Netritious.com. This site will mostly be managed directly from my reliable Motorola Backflip (Android 2.1), which also serves as a real-time mobile service monitor and manager. Imported old posts as keepsakes. 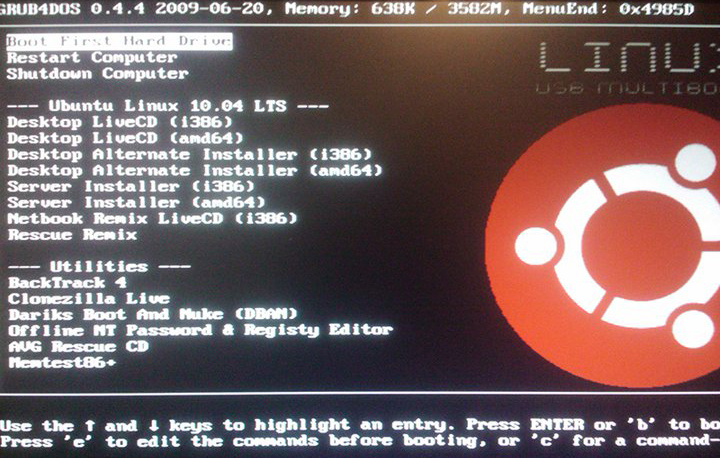 Boot Ubuntu Live CD, Server Installation, Alternate Installation, and Much More From USB Flash Drive. Reduce waste, cost, and clutter by burning fewer CD’s. Install the latest Ubuntu Long Term Support (LTS) release of your choice with ease. Powerful yet small enough to fit in your pocket. Safely demonstrate Ubuntu to friends and family on their computer without making permanent changes. Backup and Restore files and/or entire drives to alternate media or network file server. Boot to a Live CD when Windows is broken for emergency access to internet services. Remove Windows Virus Infections/Spyware/Malware even if you can’t boot into Windows! Choose from Live CD versions or Server/Alternate installs, both i386 and amd64 releases. Can be extended to support just about any distribution of Linux or Windows. Works with almost any IBM Compatible PC manufactured during and after 2005. Time and Patience. This project can span many hours, possibly days. Only works on modern computers manufactured during and/or after 2005, and even then it is not exactly standardized. You may do all this work just to find out you have to burn a CD anyway for some old computer that doesn’t support booting USB-HDD in the motherboard BIOS. I haven’t worked out how to do this completely from scratch using Ubuntu desktop. However, a Clonezilla image to use as base to build on is prepared and will be linked soon. This method worked for me but it’s no guarantee it will work for you or the computer you want to boot using USB. The reasons why your particular computer won’t boot from the USB device is beyond the scope of this article. You can leave a comment if you run into trouble. Someone probably will reply. * My procedures fall short of amazing using Ubuntu to create the multi-boot device therefore scope is limited simply to Ubuntu 10.04 LTS versions/remixes and ISO based booting. Please do leave comments about how to properly setup GRUB4DOS via Ubuntu Desktop or command line. I can’t seem to figure out the difference between syslinux.exe -maf <drive>: in Windows vs syslinux -F /dev/sd<Xn> except the latter just doesn’t seem to work like I think it should. ** If you can avoid reinventing the wheel and save time you should. Using Windows XP-7 with “MultiBootISOs USB Creator” from Pendrivelinux.com is the fastest way I’ve found yet. 1. Plug in your USB flash drive that you want to make bootable. Close any prompts or windows that open concerning the drive. 3. Change “File System” to FAT32 (if it isn’t already). 4. Uncheck the box “Quick Format” and click “Start”. 5. You will receive a Warning message about formatting. Click “Ok”. 6. When formatting is complete click “Ok”, then “Close”, then exit Windows Explorer. 7. Download MultiBootISOs USB Creator from Pendrivelinux.com. 8. Find the downloaded file MultiBootISOs-2.1.4.7.exe. Double-click to run. 12. Check the box “Download the zip” and click “Yes” when prompted. This will open a web browser and prompt you to download the memtest86+-4.10.iso.zip file. Remember where you save it. 13. Click the “Browse” button in MultiBootISOs USB Creator Window to select the memtest86+-4.10.iso.zip that you downloaded in the last step. 14. Click the “Create” button. Click “Yes” when prompted both times. 15. When you see “Installation Done. Process is Complete” click “Next”. Click “Yes” to add BackTrack 4 Final. Follow steps 3-15 just replacing references to Memtest with what you are actually adding. Click “Yes” to add and Clonezilla if you have already added BackTrack 4 Final. Follow steps 3-15 just replacing references to Memtest with what you are actually adding. Click “No” to exit “MultiBootISOs USB Creator” and go to next step. 17. Download versions of Ubuntu 10.04.1 Desktop, Server, Alternate (i386 and amd64), and Ubuntu Netbook Remix using your preferred method from http://releases.ubuntu.com/lucid/. I recommend using uTorrent on Windows and the torrent links listed at the bottom of the web page, but if you are not familiar with torrent use regular http:// links at the top of the page to download using just your browser. You *CAN* save Desktop and Netbook versions directly to USB flash drive, but save Server and Alternate ISOs elsewhere. Server and Alternate do not work properly in ISO form. More instruction on this to follow. If completed <4 ISO files, repeat steps 20-23 for each additional Server or Alternate ISO file not yet completed. If completed all four ISO files, continue to step 24. 24. Copy/paste menu.lst on the USB flash drive to create a copy. Open menu.lst with notepad and replace the contents with the menu.lst here. 25. Optional: Download my customized Ubuntu themed splash.xpm.gz to the USB flash drive, replacing the one from Pendrivelinux.com. Reboot the computer and have fun! When I first set out using Ubuntu last year I tried using apt-cacher to minimize the amount of traffic to and from my network and Ubuntu servers for updates. Why? Because the experience of installing a package or updating a fresh Ubuntu installation takes a fraction of the time, saves bandwidth, frees up Ubuntu servers, and works when an internet connection is unavailable. apt-cacher did not work out for me, probably because I was so green at the time. However, the process described in the Ubuntu Community Documentation about using debmirror is straight forward and thorough. So far following this guide has provided me with good results. Don’t create a mirror for a single computer. It’s a complete waste of time, effort, and bandwidth if you do IMHO. Use the list at https://launchpad.net/ubuntu/+archivemirrors to find an official Ubuntu mirror instead of using the default <your country>.archive.ubuntu.com. Consider speed and latency from the hosts that are available in your country from the list. I used the Argonne National Laboratory mirror in Chicago, IL, since it was up to date, offers a fast 10Gbps connection, and had a low ping latency. Do your initial run from a selected mirror to speed up the process, but change your config in the script from the documentation back to <suitable-mirror>.archive.ubuntu.com, and re-sync. I had over 75 HTTP 404 errors after the first run and changing to use us.archive.ubuntu.com resolved the issue. Prepare for your connection downstream to become congested during the first few syncs. If you have less than a 3Mbps connection, it will take a few days. I have a 16Mbps connection and it still took about 36 hours and the speed averaged (almost) 7Mbps. If you followed the documentation for debmirror to a ‘T’ then you will need to remove the line from the script that contains –progress so your cron generated emails aren’t a mile long. Again, if you followed the tutorial to a ‘T’ then like myself you may be wondering what the effect of only mirroring the .deb’s and not the deb-src are in the sense of installing packages that require building some dependency from source. To be honest I’m uncertain if it has any affect at all. I have installed at least 50 or packages with my new local repository and haven’t seen any ill effects. In comparison, this is something that is very convoluted with Microsoft products. I was never happy with the amount of work involved to keep local machines updated from a local source be it from a network share or CD/DVD media. In my opinion there are fewer caveats with a locally hosted Ubuntu mirror. Here is the final script that now runs every twelve hours. Updated (22:58): Fixed grammar and typos. Added example of current mirror size. Added my adjusted script from the debmirror Ubuntu Community Documentation. What do you get when you install pfSense on a WatchGuard FireBox x1250e? You guessed it – pfGuard. “pfGuard” to the best of my knowledge was coined by someone at the pfSense forums, which by the way has some mighty helpful folks. A Special Thank You To “Anonymous” for donating the WatchGuard FireBox, To BSD Perimeter, LLC. for pfSense, and the members of the pfSense forums, who without posting their successes and failures I wouldn’t have been able to pull this off! View more by category: Archived (21), Status (3). .